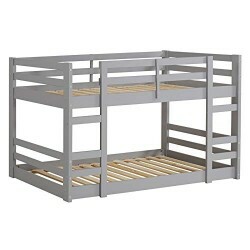 Provide your kids with easy access to their sleeping space with this low twin bunk bed. Making it simple for your kids to climb into each bunk with ease, due to its low floor design. Perfect for small space living, this twin bunk bed takes up minimal space and provides sleeping room for two. Made of solid pine wood in a beautiful painted finish for a traditional and transitional style to coordinate with any décor. Including two side ladders and guardrails on the top bunk for safety.